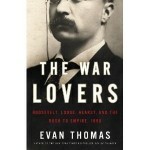 Newsweek editor and bestselling nonfiction author Evan Thomas is coming to the Hearst Castle Visitors Center on Saturday, May 8. Thomas will be in the main gift shop from 1 to 4 p.m., signing copies of his new book, The War Lovers: Roosevelt, Lodge, Hearst, and the Rush to Empire, 1898. With its title taken from an old John Hershey novel, Thomas’ book draws parallels between the Spanish-American War of 1898 and American involvement in Iraq during the last decade. Thomas looks at the respective roles played by Theodore Roosevelt, Henry Cabot Lodge, William Randolph Hearst, William James, and Thomas Reed in shaping public opinion into supporting the war effort. Thomas is a veteran reporter and editor for both Time and Newsweek magazines. He has previously written biographies of John Paul Jones and Robert Kennedy and teaches journalism at Princeton University.